I have to add – simply in terms of human rights – that anyone who has to listen to Theresa “Let’s Get On With It” May for more than a few minutes has my profound sympathy. The Saudi foreign minister, Adel al-Jubeir, a very intelligent Richelieu, must surely feel the same impatience when he listens to the patently dishonest ramblings of his opposite number. Boris Johnson’s contempt and then love for the Balfour Declaration in the space of less than 12 months is recognized in the Arab world as the cynical charade that it is. 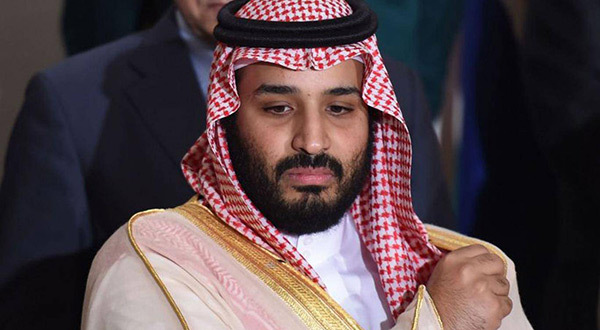 Human rights groups, Amnesty and the rest are angrily calling Crown Prince Mohammad to account this week. So are the inevitable protesters. Any constable who raises a baton to keep order will be “doing the Saudis’ work”, we can be sure. But I fear that the Crown Prince should be far more concerned by the Government which is now groveling to his leadership. For he is dealing with a Western power, in this case the Brits. And the only advice he should be given in such circumstances is: mind your back. Yasser Arafat – not that we even think of him these days – was a Palestinian super-terrorist in Beirut. He was the center of World Terror until he shook hands with Yitzhak Rabin and Bill Clinton, at which point he became a super-statesman. But the moment he refused to deviate from the Oslo agreement and accept “Israeli” hegemony over the West Bank – he was never offered “90 per cent” of it, as the American media claimed – he was on the way to super-terrorism again. Surrounded and bombarded in his Ramallah hovel, he was airlifted to a Paris military hospital where he conveniently died. The “Israelis” had already dubbed him “our bin Laden”, a title they later tried to confer on Arafat’s luckless successor Mahmoud Abbas – who was neither a super-terrorist nor a super-statesman but something worse: a failure. It should not be necessary to run through the other Arab transmogrifications from evil to good to evil again. Nasser, who helped to overthrow the corrupt King Farouk, quickly became a super-terrorist when he nationalised the Suez Canal and was called the “Mussolini of the Nile” by Eden – a slightly measly comparison when you remember that Saddam became the “Hitler of the Tigris” in 1990. [His eminence Imam] Khomeini was a potential super-statesman in his Paris exile when the Shah was overthrown. Then he became a super-terrorist-in-chief once he established the Islamic Republic. The French Jacobins thought that Hafez al-Assad was a potential super-statesman but decided he was a super-terrorist when Bashar al-Assad – lionized in France after his father’s death – went to war on his opponents, thus becoming a super-terrorist himself. The Brits quickly shrugged off their loyalties to Omani and Qatari emirs when their sons staged coups against them. Or a real war breaks out with Iran? Please note, no mention here of the Sunni-Shia struggle, the 2016 butchery of Shia opponents in Saudi Arabia – most described as “terrorists”, most of them decapitated – and absolutely no reference to the fact that Saudi Arabia’s Wahhabist doctrines are the very inspiration of Isis and al-Qaeda and all the other ‘jihadi” mumbo-jumbo cults that have devastated the Middle East. Nope. The truth is, you can’t just tell who your friends are these days. Wasn’t it the Brits who double-crossed the Saudi monarchy’s predecessors in Arabia by promising them an Arab empire but grabbing Palestine and Transjordan and Iraq for themselves? Wasn’t it the Brits who published the Balfour Declaration and then tried to betray the Jews to whom they’d promised a homeland and the Arabs whose lands they had promised to protect? Wasn’t it – since we are talking autocrats – the Brits who gave Ceaucescu an honorary knighthood and then took it back when he was deposed? We gave Mugabe the same gong and then took it back. Incredibly, we gave one to Mussolini too. Yes, we took it back in 1940. So have a care, Crown Prince Mohammad. Don’t trust perfidious Albion. Watch your back at home, but also abroad. Thanks for all the arms purchases. And thanks for all the intelligence bumph to help us keep track of the lads who are brainwashed with the Wahabi faith. But don’t – whatever you do – be tempted by an honorary knighthood.